Omron® Fitness products allow you to stay ahead of your game. With the accuracy of Omron® at your side, you can focus on going farther. 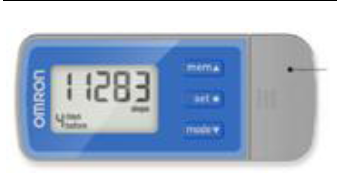 Omron® Fitness products allow you to stay ahead of your game by providing continuously precise readings. With Omron, you can set specific goals that are achievable. It’s that rewarding sense of achievement that motivates you to do more to break your personal best. And with the accuracy of Omron® at your side, you can focus on going farther. 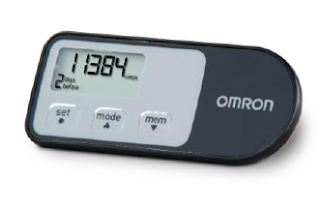 Consumer Reports consistently scores Omron fitness products high in their rankings. Combining all the activity-enhancing features of 3D smart sensor technology pedometers with Omron’s web-based solution & software, the HJ-322U downloadable pedometer provides an engaging and information-driven way to improve one’s health. Omron’s new software is compatible for both PC & Mac users. Physical activity is essential to staying healthy, and every small step can lead to big improvements. With its renowned accelerometer technology, the Omron HJ-321 is specifically designed for the power walking. The HJ-321 clips to the hip and tracks aerobic (i.e., “brisk”) steps separately from normal walking steps.